unevenly cooked, but the toasted side looks very appealing. spice, but nevertheless they look very unappetizing. 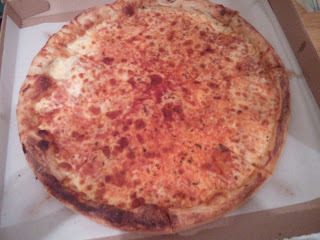 Miro's Comments: Awfully greasy, but it has that authentic cheese tang. It's also in a thick enough layers to really provide some bite. Elizabeth's Comments: This slice has a lot on it but it's very bland and very greasy. went to as a kid. Strong and herbey. really tell even when I stick my tongue under the cheese to fish for it. out of the over, but it's got decent flavor and a good chew. or structure to it which gives a soggy feel. the entire time I've been eating it. for waiting up for me. distance from my office, but I wish I had enjoyed it more.